A long established church within the growing community of Bracebridge Heath. There’s a warm welcome for all. 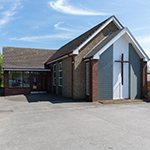 To find out more about Bracebridge Heath Methodist Church, or to enquire about hiring the church building, please head over to our contact us page or email bracebridgeheath@lincolnmethodist.co.uk to contact the minister.